Welcome to Holy Apostles frequently asked questions page. Q: I am interested in taking online classes, am I a good candidate to study online? A: While students who study online do not need to have a degree in Computer Science, they do need to have some “tech savviness”. Being able to communicate via email is essential since the students as well as the faculty are from all around the world, on very different timezones. Our courses are taught through what is called a Learning Management System; we use Populi. When you begin your studies with us, we provide a 2-week free Populi Orientation course. This helps you navigate the Populi system. However, it doesn’t help you with basic computer skills. It is assumed that you have those. What are some of those skills besides being able to use email? Knowing how to upload and download documents to or from the computer is essential since the professors will need you to download files (pull files “down” to your personal computer) as well as need you to upload your papers (push your personal files “up” to a location where the professor can see them). A number of professors will require the use of Microsoft Office Suite products such as Power Point, Excel and Word. You will need to purchase this software or use some free comparable software that allows you to view Microsoft files through them. Can you view videos or listen to CDs? Do you know what a Browser is and can you navigate around one? Can you use an online database, such as one that our library provides, for publications? If you don’t feel comfortable with some of these, then you would likely benefit from taking a small computer course through places like your Public Library or a Geek Squad group. It’s also helpful to have someone near your home (like a teenager or a tech support person) that you can call when you get stuck. The Technical people at Holy Apostles are here to help with Populi issues, but we simply cannot teach beginning computer skills at this point in time. Q. Is the Holy Apostles Online Learning program accredited? 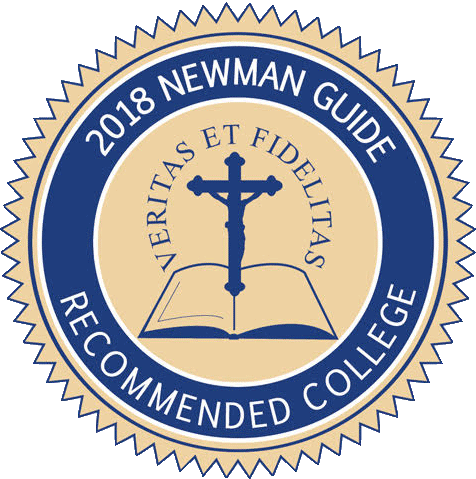 A: Holy Apostles College and Seminary, including our online learning program, is accredited by the New England Commission of Higher Education (NECHE) and by the State of Connecticut Board of Higher Education. You may see more about our Accreditation standings HERE. Q. Is there a residence requirement for the Holy Apostles Online Learning program? A: There is no residency requirement for the Holy Apostles online program. The Associate of Arts program can be completed entirely online within three years of matriculating into the program. The Bachelor of Arts and Master of Arts programs can be completed entirely online within six years of matriculating into the program. Q. What computer programs and requirements do I need in order to be successful in the online program? Our Online courses are taught on the Populi Learning Management System. A reliable high-speed Internet connection is necessary, as students will need to access all courses which reside on Populi. Populi requires the use of one of the following Web Browsers: Google Chrome, Firefox, or Safari. If you already have any of these versions of web browsers, please ensure your version is up to date. Most any computer system that is three years old or newer should work fine. A printer is highly recommended so that students can print out syllabi, emails, and discussion forum conversations. Students also need software such as Microsoft’s Office Suite (Word, Excel, Power Point) or OpenOffice. It will be your responsibility to purchase or download these programs if and when necessary. Some courses offer the opportunity for synchronous engagement through Skype, WebEx, or other video conferencing software like Google Hangouts. Students are encouraged to familiarize themselves with these products in those classes that offer them as options for synchronous engagement. Finally, some courses require DVD and/or CD lectures, so students will need a DVD and CD-compatible player for such courses. Q. What degrees does the Holy Apostles Online Learning program offer? Our Online Learning programs include both undergraduate and graduate studies. Undergraduate Students can earn the following degrees entirely online: Associates of Arts degree, Bachelor of Arts Degree, majoring in a number of subjects. Graduate Students enrolled in our program can earn the following degrees entirely online: a Master’s degree in Philosophy, a Master’s degree in Theology, or a Master’s degree in Pastoral Studies. Holy Apostles also offer Graduate Certificates as well as Post Master’s Certificates. High School and Homeschooled students have the opportunity to earn college credits through our Take Credit! Program and our Angelicum Academy Partnership. We currently do not offer an M.Div online at this time. You may explore more details about our Academic Programs HERE. Q. I am a current student at Holy Apostles, and I want to enroll in a class, what do I need to do? A: For all current undergraduate students, please contact your Academic Advisor. For all current graduate students, please contact onlineregistration@holyapostles.edu . Q: I am a current Holy Apostles student and I need an official transcript, how do I obtain one? A: Please visit the Transcript Request Page. Q: I am interested in pursuing Financial Aid, what do I need to do? A: Please visit our Tuition and Financial Aid page for more information on our financial aid policy, FAFSA and contact information. Q: What is the difference between a degree-seeking student, a Personal Interest Student and a Personal Enrichment Student? A: Degree-seeking students are pursuing one of the following: AA (Associates of Arts) degree, BA (Bachelor of Arts) degree, MA (Master of Arts) degree, PMC (Post Masters Certificate), or a GC (Graduate Certificate). Personal Interest students merely want to take a few courses in order to learn about a particular subject or to have those courses transferred to another institution. They are not pursuing a Degree with Holy Apostles. Personal Enrichment students are allowed to take an approved 500-level course without having to go through the full admissions process. This course would be audited (not for credit) and would thus cost half of what a for-credit tuition would cost. Currently, Prof. Patrick Madrid’s course, “Apologetics”, is the only course that can be taken as a Personal Enrichment student. Personal Enrichemnt students are not required to hand in assignments or take tests, unless they want to, since they are receiving no grade for the course. Q. What is the enrollment policy for the Online Learning program at Holy Apostles, and how are the semesters set up? A: The online program has a rolling admissions policy. We offer three full semesters of course work per year divided up over sixteen-week sessions. Our sessions run in the Fall, Spring and Summer. A student interested in the DL program can enroll in one class as an in-process student while a completed application is on file. Q. Is your program open to residents outside of United States? A: Yes. We regularly enroll students from Asia, Australia, and Europe in our programs. Please note that all tuition and fees must be paid in United States Dollars. Q: Do you make accommodations for students with disabilities? A: Yes. The college has a process in place to accommodate for students with disabilities. Students in need of this kind of accommodation may submit, along with their application, a Disabilities Accommodation Form with documentation of the disability. Q: How much does it cost to study at Holy Apostles? A: Current tuition for a three-credit course at Holy Apostles is 72% lower than the average private colleges/universities. Please see our Tuition & Financial Aid for details. Some courses require DVD lectures, others CD lectures, while others utilize text and Internet-based resources. This information is available with our registration materials that can be purchased before each semester. Q: Where can I locate my course syllabus and required books/materials? A: A course syllabus is made available before the start of each semester’s registration period. All required books and materials will be listed on the course syllabus. You may find a listing of the current semester’s syllabi by visiting Online Courses & Registration Information. Q: How quickly do faculty respond to student emails? A: The Faculty Response Policy, effective October 15, 2013, reads as follows: All faculty will respond to emails from students within 48 hours of receipt. If faculty plan to be away from their email for longer than that period, they should notify their students of their absence and post an out-of-office message on their email providing a reasonable time frame in which a response may be expected. Q: How do I contact the state board of education in the state in which I currently reside in order to register a complaint against Holy Apostles should the need ever arise? A: Holy Apostles College & Seminary is currently completing a two-year effort to ensure that the college is authorized to operate in every state in which its students reside. Should you exhaust the grievance procedures at the college itself in your pursuit of a redress against the institution, you are invited to submit your complaints directly to the Office of Higher Education within the state in which you reside. Please visit WCET’s page at http://wcet.wiche.edu/advance/state-approval-complaint to find the information for the state in which you reside. Example: Holy Apostles College & Seminary is currently filing paperwork to be authorized to operate in the State of Maryland. Residents of the State of Maryland who wish to submit a complaint may use the following contact information: Office of the Attorney General, Consumer Protection Division, 200 St. Paul Place, Baltimore, MD 21202. Please see the Student Complain Process for the State of Maryland located at: http://www.mhec.state.md.us/higherEd/acadAff/MHECStudentComplaintProcess. Q: What is the refund policy for tuition? A: Please visit our Tuition & Financial Aid page for details regarding the refund policy. Q: I am interested in an Associate of Arts Degree or a Bachelor of Arts Degree, what do I need to do to apply? A: Students must complete our undergraduate application and submit all the needed documentation. The link for the undergraduate application is HERE. Please see the Undergraduate Admissions Page here for more information on the documentation needed. Q: I have earned college credits at another Institution and would like to complete my undergraduate degree at Holy Apostles as a Transfer student, what do I need to do to apply? What is the Policy? A: Students must complete our Transfer Student application and submit all the needed documentation. The link for the Transfer Student application is here: (application link) Please see the Undergraduate Admissions Page here for more information on the documentation needed. Holy Apostles may accept up to 30 undergraduate credit hours with a grade of C or higher from accredited colleges towards a student’s Associate of Arts Degree and may accept up to 60 credit hours with a grade of C or higher from accredited colleges towards a student’s Bachelor of Arts Degree. All transfer credits are accepted at the discretion of the Academic Dean. Q: As an undergraduate student, can I double-major? A: Students pursuing an Associate of Arts degree may not double-major. Students pursuing a Bachelor of Arts degree may double-major in any of the majors that are offered at Holy Apostles on the undergraduate level. Q: How many total credits are needed to complete an Associate of Arts Degree and/or a Bachelor of Arts Degree? A: Students pursuing an Associate of Arts Degree must earn a minimum of 60 credit hours to earn their degree, and a minimum of 120 credit hours to earn a Bachelor of Arts Degree from Holy Apostles. Q: I am a senior in high school/home school, do I have to take the SAT/ACT/CLT? A: Yes. As a part of the application process, students with 0-12 college credits must submit official scores from one of the standardized tests listed. Students must submit either their SAT, ACT or CLT scores as part of their application. The essay component is highly recommended, but not required. Q: What is the Take Credit! Program? A: The Take Credit! Program is available to any current high school and home-schooled student who has completed their 10Th-grade year to begin earning college credit before their graduation. For more information visit the Take Credit! Program page here. Q: Do you accept credits from programs with courses recommended by the American Council of Education (ACE)? A: Yes, it is the policy of Holy Apostles College & Seminary to accept credits that have been recommended by ACE that meet the normative criteria for transfer of credit. Q: I am interested in pursuing a Master of Arts, or a Post Master’s Certificate, or a Graduate Certificate. What do I need to do to apply? A: Students must complete our Graduate application and submit all the needed documentation. The link for the Graduate application is HERE. Please see the Graduate Admissions Page for more information on the documentation needed. Q: Can I transfer Graduate credits earned from another Institution to Holy Apostles? A: We can accept up to 6 credits of transfer credits from another regionally accredited institution. An official transcript plus a catalog listing must be sent to us so the Dean can be sure that the courses taken meet our criteria of being Thomistic based courses with grades of “B” or better. In addition, the courses taken cannot have been used towards a previous degree. Q: Can you tell me more about the Graduate Summative Evaluation process? A: All MA programs require a Summative Evaluation at the end of one’s studies. The MA’s in Theology and Philosophy allow for a choice between either taking a Comprehensive Exam or writing a thesis. The MA in Pastoral Studies requires the Comprehensive exam only. Please see the Summative Evaluation Page to understand the process of each choice. Q: I’ve heard that students can study through the National Catholic Bioethics Center (NCBC) and earn Holy Apostles credit. How does one pursue this avenue? A: Yes, students can take the courses offered at the NCBC and earn 9 Graduate credits. These credits can be either transferred to a different institution or used towards our MA in Theology degree, concentrating in Bioethics. The courses become 3 out of the 4 Bioethics concentration core courses, leaving the student with the final 9 courses to be taken on our Learning Management System. Please see the MA Theology Bioethics w/ NCBC Certification Concentration page. Q. How many classes or credits must I take to earn my M.A. at Holy Apostles? A: For the Master of Arts, students need a total of 36 credit hours (Twelve 3-credit courses). M.A. coursework includes 2 co-requisite courses, 4 program core courses, 4 concentration core courses and 2 electives. Q: Do I have to take the co-requisite courses in the MA program if I have a B.A. in philosophy or theology? A: A student entering our M.A. in Theology with a B.A. in Philosophy from a Catholic institution is exempt from taking Philosophy for Theologians co-requisite course the former institution was from a Thomistic background as provided by his transcript and/or syllabi. A student entering our M.A. in Theology with a double-major of Philosophy and Theology from a Catholic institution is exempt from both co-requisite courses the former institution was from a Thomistic background as provided by his transcript and/or syllabi. A student entering our M.A. in Philosophy program with a B.A. in Philosophy from a Catholic institution is exempt from both co-requisite courses, Ancient and Medieval Philosophy, and Modern and Contemporary Philosophy, if he has a Thomisitc background as provided by his transcript and/or syllabi. A student who is exempt from one or both of the co-requisites in either of these programs simply takes an additional elective course, or two, for a total of 36 hours. Do you have a question not found here?